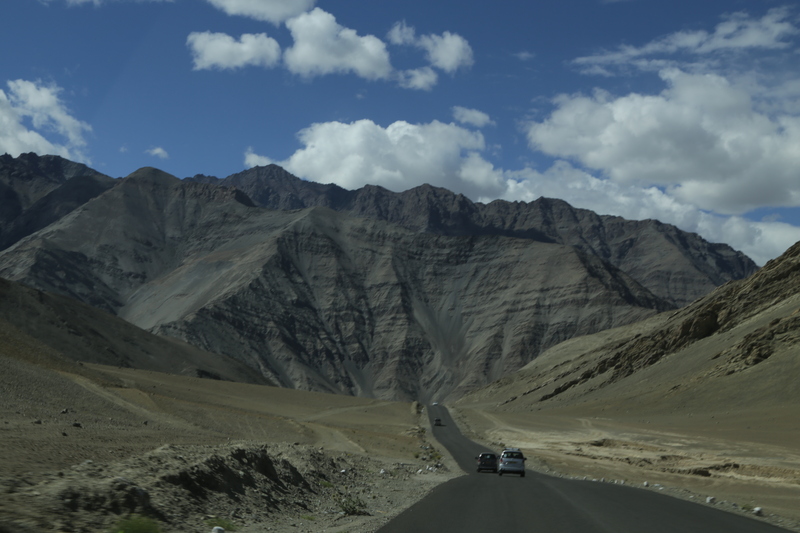 Driving from Leh to Alchi, Kargil, then leaving Ladakh for Kashmir and Srinagar today. We drove through the most desolate landscapes you can imagine. Apart from the ubiquitous military bases, there is just a road and these massive mountains rearing all around us. 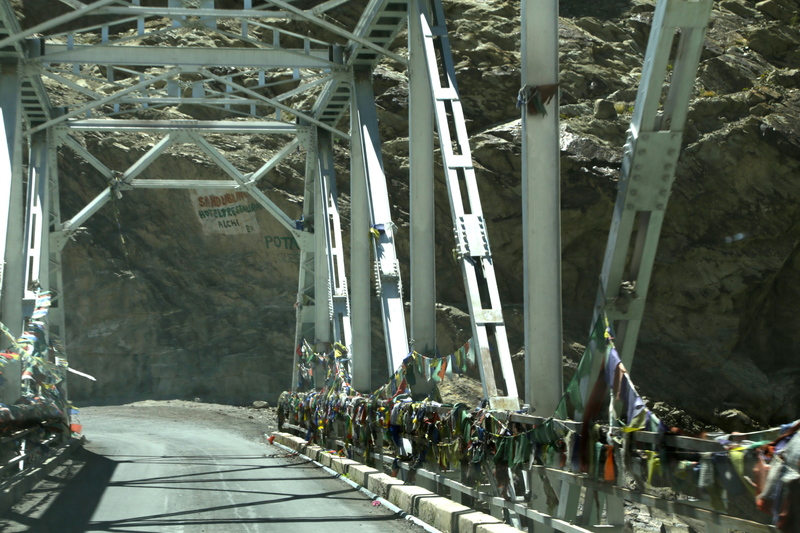 The distance between Leh and Srinagar isn’t far to my Canadian eyes – only about 500 km. but it will take us three days to make the trip I am told. There are several passes and those twisty “trails” to navigate…. 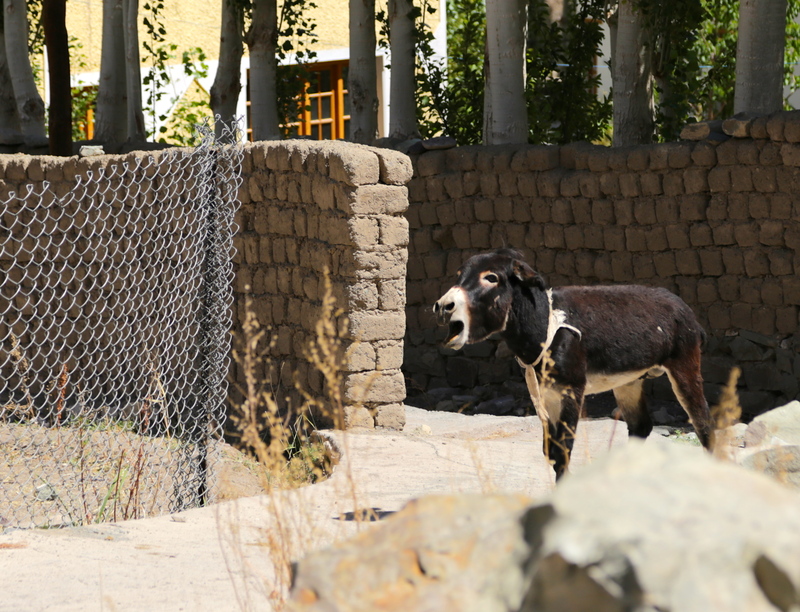 We arrived in Alchi to the raucous braying of an angry jack donkey. Fitting in a way, as that was the sole note of discord our entire stay. 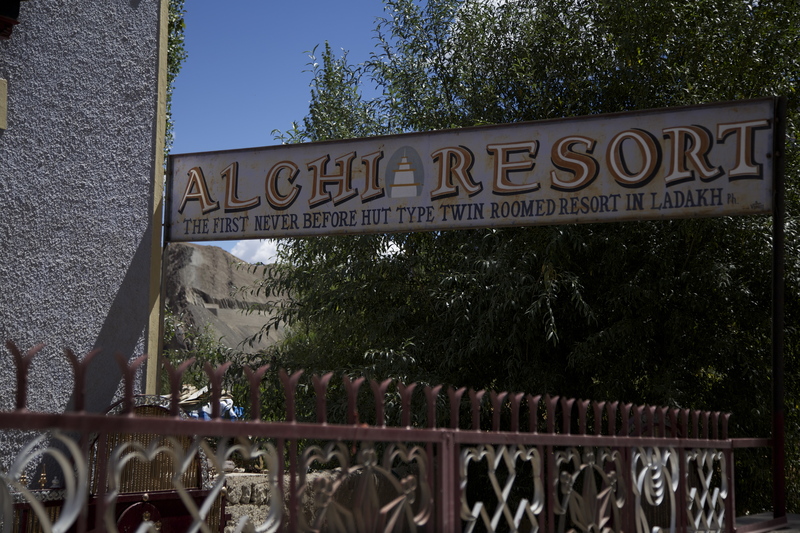 Alchi is a tiny, green oasis tucked away in a valley which is only accessible over a rather rickety bridge, festooned with prayer flags – is someone trying to tell us something? As it is off the main trail to Leh, the monastery there – which is notable for being built in a valley instead of the heights – something my knees were quite grateful for – is extremely well preserved and the village itself has a kind of “Brigadoon” air about it. The monastery, called Chhoskhor has these incredible wall paintings, hundreds and hundreds of miniature Buddha figures in all incarnations and each completely unique. Unfortunately no flash photography was allowed as they are quite fragile but the effect was stunning. The final icing on the cake, was a one of a kind, four sided Manjushri Statue. Manjsuhri are bodhisattvas associated with wisdom, and in this case show four separate aspects. I know I keep talking about the energy but this place has to be one of the most serene I have ever experienced. The hotel was unique, calming and had the most verdant gardens – still no hot water tho’. Our host looked rather dour but turned out to be most attentive indeed – perhaps he was just shy. Have a look at the Hotel sign post – remind you of anything? What a wonderful way to wake up this morning!! Your blogs continue to fire the imagination. Sounds like a most amazing trip!